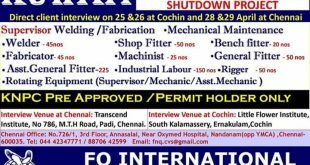 Gulf interviews in Hyderabad this week for Engineer, SUPERVISOR, mechanical, Welders, Technicians.client interview in Hyderabad for gulf jobs best salary in the market. 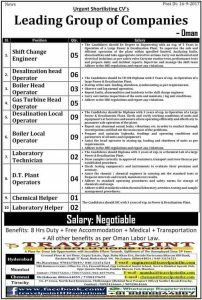 2019 latest update Today’s gulf jobs interview in Hyderabad. 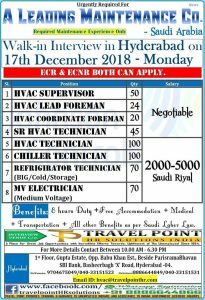 Good news for gulf job seekers attends gulf jobs walking in Hyderabad.gulf middle East interviews at Hyderabad. Walk in interview in Riyadh. Saudi Arabia. interview on 28’“ Jan 29“ Jan & 30‘” Jan 2017 at New Delhi. Interview on 31St Jan 8. 01“ Feb 2017 at ll erabad. Duty 08 Hours. 06 Days a week. as site engineers with construction companies. Company will provide the accommodation. Medical, lqama and the transportation. All other benefits as per Saudi Labour Law. STORE KEEPER MORE THAN FIVE YRS EXP IN AUTOMOBILE INDUSTRY. NEED JOB IN GULF. I have experience indai only at supervisor.sales men&deliveryboyin more then9year in 3catogires pls help me urgently any jobs this there’s one. i have 2years of experience in health care sector (MNC) as claims associate. I did my B.com graduation from Kakatiya university.i’m searching for gulf jobs . According to my qualification please send the sutteble jobs. I havr 3 years uae experiences. I am hvac tactician experience. Kuwait 3years India 6year and Dubai 3meant total 9year.3meant. 9442090208. I am HVAC PROJECT ENGINEER with 6Yrs Exp. 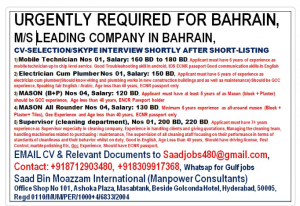 Looking job in UAE/Abudhabi. Please let me know if any suitable openings are there. Please contact directly on +919177325516. looking for graphic designer job in gulf countries i have 10.10 years exp. 2 years of experience in BIM Modeling. presently Searching for a job. WE REQUIRED SKILLED AND UNSKILLED WORKERS LIKE HELPERS, TECHNICIANS ECT.. I have available for 50 passport ………. I’m water treatment supervisor in Almarai comp Ltd. (KSA) since last 5 years. If hv any job vacancy then plz call me on 00966597526457.
currently based in Hyderabad and seeking a job to take my skills to the next level.